I always have such plans to do all kinds of reading when I’m holidaying in Singapore. But the truth is, with two kids, with family and friends to see, with things to do, places to go, foods to eat, it isn’t an ideal reading holiday. So every time I go, I load up my Overdrive app from the library on my Nexus 7 tablet, and also download a few Overdrive-Kindle books, and this time also, some Scribd books. All with good intentions to do lots of reading. I did manage to read a few books this time. Here is one of them. And that kind of explains it all. It is a story about two teenaged girls caught up in a lie of their father’s making. Dana is the secret daughter. The one whose story we first learn of, the one we sympathize with because we are reading it from her point of view. The one who only gets her father once a week. The one who has to be kept a secret and keep secrets. Chaurisse is the ‘real’ daughter, the one who is publicly acknowledged. She lives in a different part of the same city as Dana. And she and her mother do not know about her father’s other family. We hear from her in the second half of the book. Eventually the two girls meet and even become friends, but how can this be, with one knowing what the other does not? 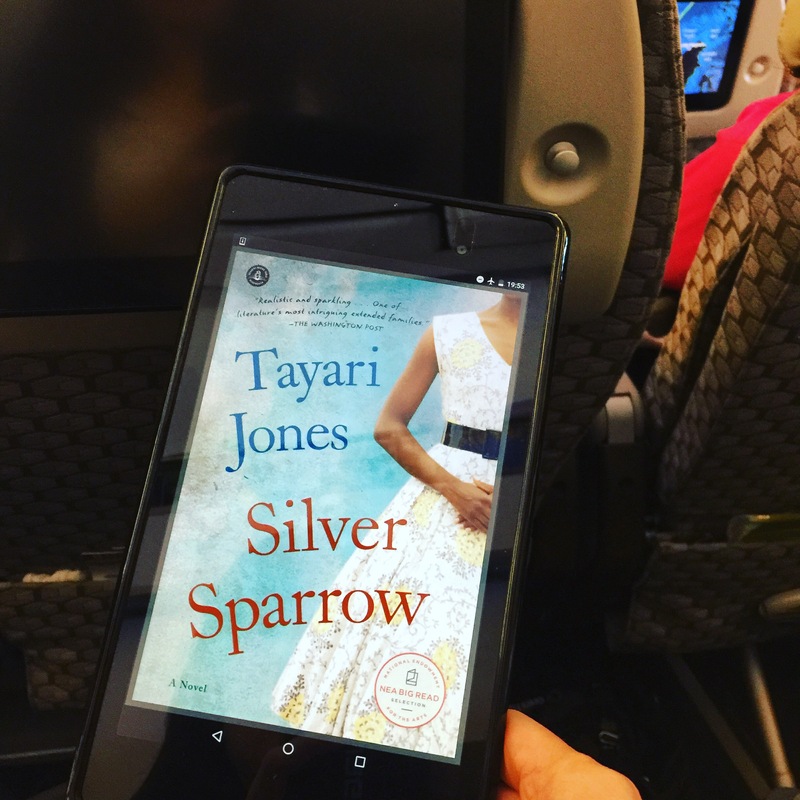 While the book focuses on Dana and Chaurisse, the strength of Silver Sparrow lies also in the way Jones’ other characters are so fully developed. The two wives, the bigamist himself and even his best friend Raleigh. All of whom contribute to this unusual family. Even James’ mother, whom we only meet for a while, is fully fleshed out, that even now, it’s so easy to imagine her as a character. Raleigh was, to me, an especially intriguing character. He’s an outsider but also part of the family, almost a second father to the girls. At the same time I am never entirely sure what he gets out of this, why he aids and abets in this deception. Silver Sparrow is such a beauty of a book. It is elegant in the way the narrative is divided into the two girls’ point of views, not in a flitting back-and-forth way as many books are written, but how we hear the story from Dana’s viewpoint, then in the second half, the plotline continues but from Chaurisse’s side. It is mesmerizing in the lies, the half-lies, half-truths that envelop them all. And with its two young women at its centre, it is bold and full of life and youth and heart.